Ah, ok then, glad you've sorted it out. Nice job chepioq, I still believe it deserves its own thread. May be it deserves its own thread, but I prefer to leave it on this thread because it is the one for "Conky weather". For me it's a training until the arrival of the new wunderground API. Unfortunately, I don't have an old curr_cond file so I can compare things to it. Wait, you weren't using the latest script? Can you post the script you're using? I can't read it right now, but do you get a proper conky when you run the latest script? Also, apologies for being a script or 2 behind. I also adjusted my file paths to be the same as the new script I posted. It seems ok, do you get any error messages when you run the script? Are the files (curr_cond, etc.) populated? Oddly enough, when tested with another url for somewhere overseas like kastoria, buenos-aires, and tokyo, the images still don't load, but the weather does. However, if I use a us city like new york, albuquerque, or even hutto, the output is the same as the pic I linked above. Unable to locate remote host www.accuweather.com. And lynx connected with no problem. I was able to see my current weather. I apologize seatommyboy, when calling accuweather for a us location the source page is completely different from when calling it for an international location. How long has this been going on? Why hasn't anyone complained? 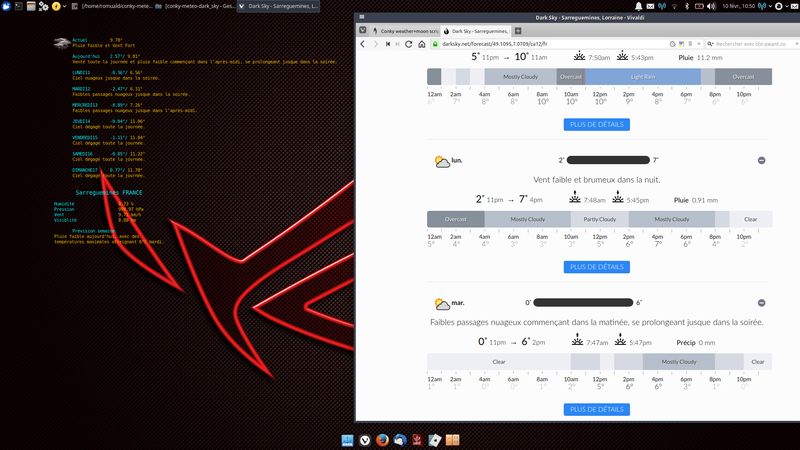 Connexion à api.darksky.net (api.darksky.net)|35.174.96.85|:443… connecté. I don't know what happen for you, that work for me. I want to say that it started happening about 3 weeks ago. But it at first, it appeared to be that sed was reading to many spaces and there would be extra characters appearing. But it fully stopped displaying any weather about a week or so ago, after I manually removed the curr_cond, etc files, and others see the weather and think it is current when it's actually residual information??? None-the-less, thanks for your help Teo! Don't forget to change the folder paths. Thanks for the feedback and hold on until the final version is out! and the weather appears correctly. Still no icons either, but I'm more worried about getting the script to run correctly first. Thanks again! Icons appear perfectly for Hutto, both the 2015 and the 2016 ones. Accuweather have changed their page layout for US locations. I've changed the script so that the latter detects whether it's an international forecast or a US one and acts accordingly. The output files have remained the same so that none of your conkyrc files needs correction. Remember to change the folder paths throughout the script and, as always with new scripts, any feedback is welcome.